It's nature time! It's flower time and it's time to share the beauty of flowers to the world. I am grateful for all people who see and appreciate the beauty of nature through flowers. You are all great guys! I am also honoured to be the guest friend for Today's Flower. This meme is my favorite of all because I love flowers so much that dear HB calls me crazy sometimes everytime we visit a garden full of flowers. I am also growing a lot of plants and flowers back home because of our beautiful weather all the time. Here in Europe, we also have a little garden where I enjoy taking care of the different plants and flowers in it. Sad to say, during winter time, they fade and some come back in the next spring time. I would like to congratulate the Author of this beautiful meme LUIZ SANTILLI JR. and his Team DENISE, GULLICKSON, LAERTE PUPO and VALKYRIEN for well job done. Keep it up guys. Starting next week, I will be away for a long vacation to my home country. It will be around a 3 months vacation. I am quite excited to see the beach, sunny weather and the blue sky and of course my beloved family and friends. I guess I am evading the winter in Europe. ..wink! I will try my best to participate in this meme every week when time permits. Sorry guys, I cannot visit you from time to time but I will try my best. Here are the beauty of nature for showing around the world. I personally took these pictures during our visit to a garden center last month. I grow these flowers before back in my home country except the Poinsettia or the Christmas Star. I guess this is quite a long post for you. Take care everyone and wishing you all a great and wonderful Holiday season in advance! amazing beauty of cacti. I have around 20 of these inside our house now. some already bear flowers before. I got hundreds of these before in my garden back home. a beautiful Bromeliad! I was crazy about these flowers some years ago that I grew thousands of it in my garden. Feel free to browse my Today's flower category here to view a photo of me in my previous garden. Another evidence is an old photo below in my garden back home. Oh how I miss those thousands of Bromeliads back home. I just scanned this picture these week and have it developed again. This was taken in the year 2000. 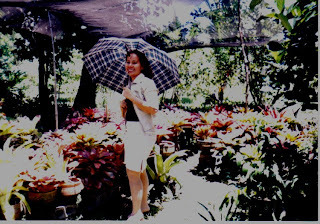 This is me striking a pose in my garden before..I wish to have it back in the future. Congratulation on being guest friend today! Very lovely flowers! Wow, you really love flowers, huh? that last photo of yours proved it! lol I have a few orchids indoor here in the US but most of them die on me. Even if I keep the room humid in the winter they still tend to dry up...but orchid is one of my favorite, their blooms stay for months. Have a safe trip back home and I'm sure you'll have a great time! Thank you for beeing our TF "guest friend". Wonderful pictures!! Your flowers are so beautiful. I love the ones featured on today's flowers home site and also the ones that are posted here. Beautiful. I hope you have a great trip to your home country. congratulation for being the guest friend for today! Thanks for "guesting" it is so nice to see everyone's gardens. Congratulations for being a guest friend today. Your garden must be wonderful! Beautiful flowers you have chosen as GFriend for TF. I grow many Bromeliads in my garden, like you did, saw your pictures. anyway, have a nice, relaxing holiday. Herzliche Gruesse.T. Your flowers are lovely. Wonderful captures! such lovely collection of photos you have. i love cacti and I have few in our backyard. have a happy and safe trip .. Thank you for sharing such a beautiful series of flowers before you go away. Have a wonderful vacation. I almost forgot to say how much I also enjoyed your flowers as Guest Friend. They are gorgeous too. I just love all your colorful cactus!! What a great entry you have! Worth visiting here. Mine is up. God Bless! Hope to see you around. A lovely post Ruby. I know well whaat it means to miss a garden fron a different climate. You have and have had such very beautiful flowers. Have a very happy visit back home. congratulations for being the guest friend today. you have a lovely flower entries. i love you colorful and vibrant cactus. Ruby: Congrats on your feature and neat flowers on you site, great week for you. Congratulations on being Today's Flowers #67 guest friend. The flowers here are gorgeous. wow, you really have a green thumb! congratulations! Amazing colors on those cacti, I also like the poinsettias and Bromeliad. Enjoy your vacation!